The first time they met, she weighed 9 pounds, 8 ounces and had a head full of dark hair. But her newborn skin was purple. Ellyn Strother was dying. Call it a mother’s intuition, but late in her second pregnancy, Carla Strother knew something was amiss. Ellyn was no longer turning somersaults in her belly. Days away from delivery, a high fever had Carla worried that her second child was literally baking inside her. It was a hard delivery; Carla still tears up as she recalls pushing hard to no avail. When Ellyn finally saw daylight, Carla saw the purple and heard the quiet. “There was no crying; there was nothing,” Carla says. Ellyn had aspirated meconium, which was choking her airway. The delivery team at University Hospital, an acute-care nonprofit hospital in Augusta, immediately began bagging Ellyn and whisked her away. An hour later, Brian Strother went to find his newborn in neonatal intensive care. She could not breathe on her own, and the usual treatments were not working. A transport team arrived from the Children’s Hospital of Georgia, just two blocks away. It was Nov. 6, 1995. Ellyn is now 20, her complexion olive-toned and her voice hearty. This summer found her back at CHOG, this time nearly nose-to-nose with the 6’3” pediatric surgeon who helped save her life that November day. This time, she was there to start the long process of learning from Dr. Robyn Hatley how she might one day do the same for other children. “As young as I could wrap my mind around it, I knew those people saved my life,” says Ellyn, AKA Number 204 for her distinction as CHOG’s 204th ECMO patient. The hospital’s neonatal extracorporeal membrane oxygenation (ECMO) program was 10 years old when she needed it, one of a handful of programs nationwide that started after it became clear that this technology could be a game changer for babies like her, typically born at term and in respiratory failure. The treatment, which borrows heavily from the technology used during heart bypass surgery, ensures a steady flow of warm oxygen-rich blood and an around-the-clock removal of carbon dioxide while letting the lungs and heart rest and ideally recover from a variety of maladies. But whereas bypass may be used for hours during a complex heart repair, babies can spend days or even weeks on ECMO. It’s still considered high-stakes medicine for exceedingly high-risk infants. But time has told the tale that for babies like Ellyn, ECMO can turn a 90 percent chance of dying into a 90 percent chance of survival. “Physicians around the country always accept the challenge that if they could do X, this patient would be OK. So everybody pushes the frontier, pushes the boundary,” says Dr. Charles G. Howell (’73), the pediatric surgeon, who along with Dr. William P. Kanto Jr., neonatologist, started CHOG’s ECMO program 30 years ago. Dr. Robert H. Bartlett, professor emeritus of surgery at the University of Michigan Health Systems in Ann Arbor, had made that decision a few years earlier when he began to push the envelope for dying babies in Michigan. 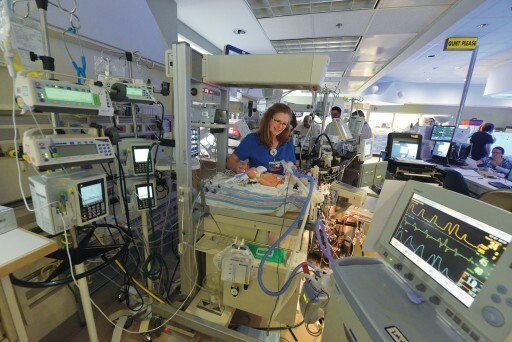 Neonatal ECMO centers soon followed in Boston, Stanford, Nashville, New York and San Diego, coinciding with the growth of neonatal intensive care units nationwide. ECMO already had been used with limited success in adults with problems such as severe asthma, near-drowning or the inability to be weaned from a heart-lung bypass machine. The centers adapted the treatment for children and some of their unique and deadly struggles, such as Ellyn’s problem of aspirating into her lungs the tar-like waste product that should be voided after birth. “Birth is a stress test for the neonate, and the vast majority of the time, they come through it very well,” says Kanto, who served as chief of the Section of Neonatology and later as chairman of the Department of Pediatrics. Labor contractions briefly restrict placental blood flow, and most babies deal with it fine. But a variety of factors may leave the unborn baby hypoxic and gasping for air, which is how meconium can clog the lung’s airs sacs. Meconium also deactivates surfactant, a soapy substance made of lipids and proteins that helps keep air sacs open. It will take another 48 hours for the body to make more surfactant. And, while the body also has mechanisms to clear the meconium, it takes time and help oxygenating the blood while this natural process happens. Conventional ventilators, which force air into the lungs, can actually exacerbate the damage. 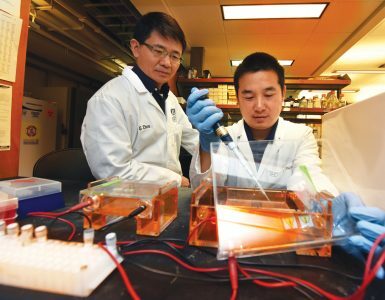 High-frequency ventilators, which more gently move air to and from the lungs, have proven a much better option. 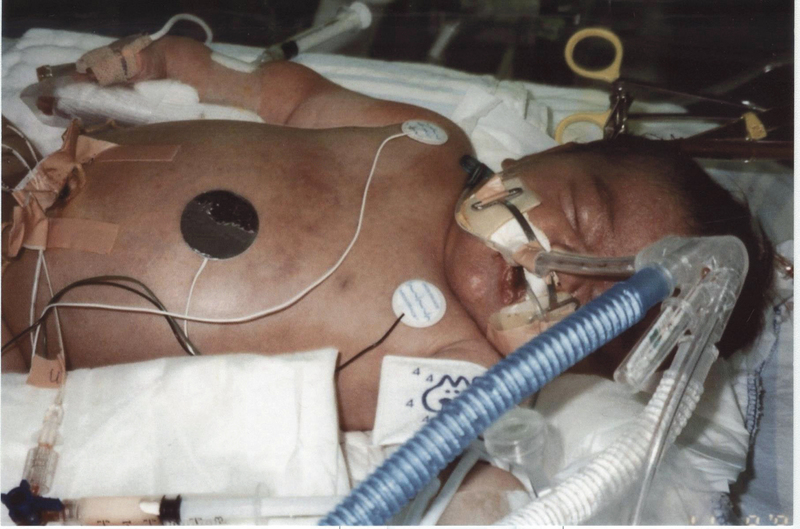 These ventilators, along with doses of artificial lung surfactant, remain frontline therapies for MCG neonatologists before turning to ECMO, says Dr. Jatinder Bhatia, chief of the MCG Section of Neonatology. Despite great strides with ECMO, it is still considered a therapy of last resort. Hatley shares with Ellyn one of his early cases when he was hesitant to put a 6-year-old on ECMO. The need to sacrifice a carotid artery weighed heavily on his mind. In those early days, pediatric patients were always placed on ECMO via the carotid artery and jugular vein on one side of the neck. Sacrificing one of the two major arteries that carries blood to the brain can cause a stroke or other neurological deficits. 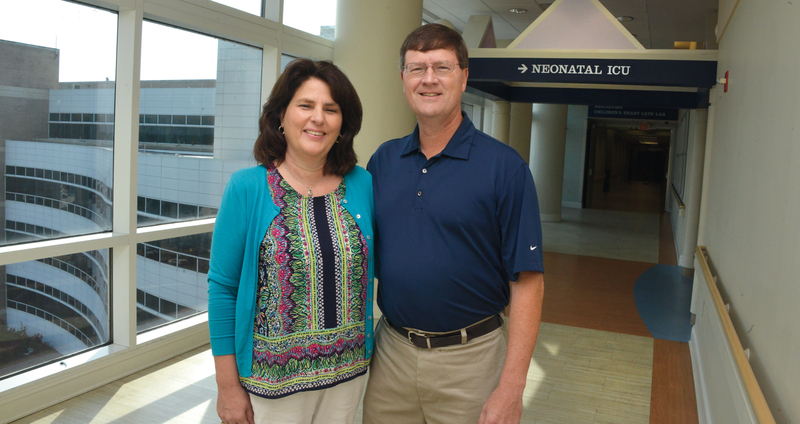 So Hatley called Bartlett, who reminded him that ECMO was the child’s only option. “That kind of put things in perspective. You always look at risk and benefit,” Hatley says. The child did fine. ECMO takes pressure off the lungs and takes over up to 80 percent of the work of the heart. It takes a lot of energy to breathe, and ECMO patients’ lungs, at least temporarily, just can’t do it. “That’s why it’s a lethal situation,” says Hatley, a physician drawn to surgery because of his drive to fix these kinds of problems, particularly in children who are hapless victims of circumstance. 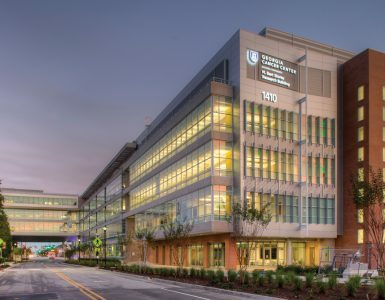 In those early years particularly, patients came to Augusta from across the Southeast; Ochsner Health System and Vanderbilt University were the closest other ECMO options. “We took babies that were the sickest and the ones that were dying from respiratory failure,” Howell says. 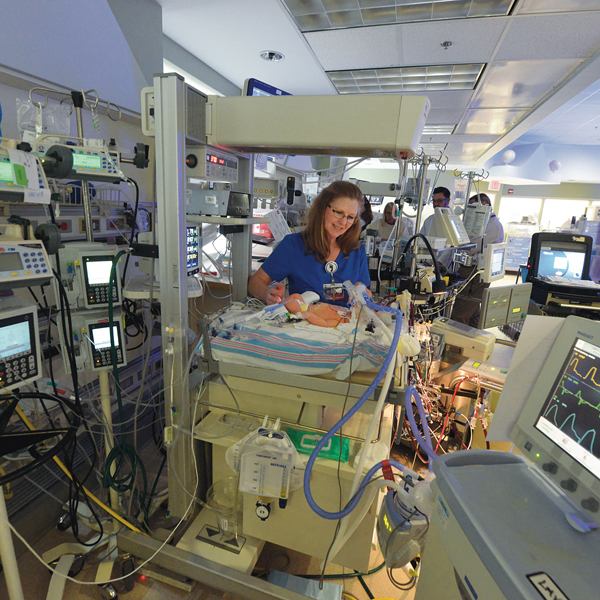 Only about 20 percent of those babies ultimately needed ECMO because MCG’s neonatologists and NICU team worked – then and now – as hard to keep babies off as they did to put them on. “We reach for surfactant first,” says Bhatia. This systematic approach has edged ECMO use down in recent years at MCG and nationally. At the CHOG program’s inception, Howell and Kanto traveled to Michigan to study under Bartlett. 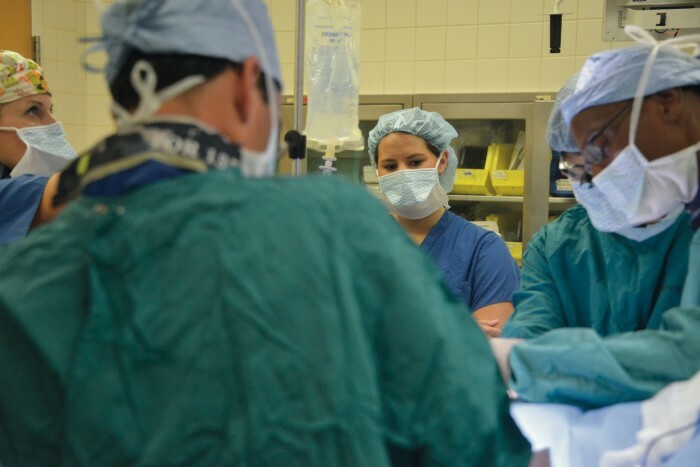 As the ECMO team in Augusta grew and matured, they began to also make some adjustments of their own. An early lesson was that babies with diaphragmatic hernias – with intestines breaching the chest cavity and compressing the lungs – shouldn’t be transferred after birth. “You may not survive to get to the place that has ECMO,” Howell says. “You may need ECMO within a few minutes, within a few hours after birth.” And ultrasound enables a diaphragmatic hernia to be identified before birth. Experience also taught them to use ECMO on smaller and even slightly premature babies when needed. Preemies still tend to be a particularly high-risk group, as cannulas may not fit in their blood vessels and they are vulnerable to excess bleeding. They learned they could decrease bleeding risk for all babies by minimizing the dosage of the blood-thinning drug, heparin. The neonatal ECMO team was among the first to also give antithrombin III, a natural partner for heparin inside the body. 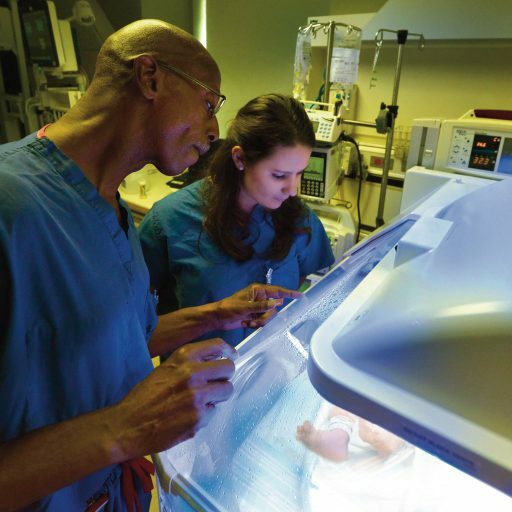 This approach is now the industry standard, says Linda Wise (GRU College of Nursing, ’83), ECMO and neonatal transport coordinator. CHOG’s ECMO program has received five consecutive Extracorporeal Life Support Organization Awards for Excellence in Life Support. The first baby was put on ECMO at CHOG March 16, 1985. By the end of the calendar year, 16 babies had been placed on ECMO support, 13 of whom survived. The center treats an average of 18 ECMO patients per year. The highest CHOG survival rates (97 percent) for ECMO patients are those with Ellyn’s condition of meconium aspiration. The rate is 93 percent nationwide in ECMO centers with comparable caseloads. The lowest survival rates are for ECMO patients with congenital diaphragmatic hernias – 56 percent at CHOG, compared to 50 percent nationwide at centers with comparable caseloads. As of August, CHOG’s ECMO program had treated 523 patients (490 of whom were neonates) in 2015. Along with their colleauges across the country, the MCG team also learned most ECMO cases didn’t require sacrificing a carotid artery. Eighty percent of newborn respiratory patients now receive a two-lumen catheter that accesses a single jugular vein, Wise says. ECMO and the team have come a long way in 30 years. 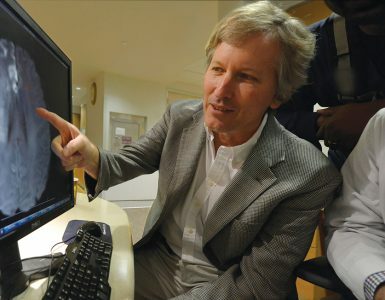 “Thirty years ago, we made our own cannulas [by filing and burning chest tubes],” Hatley tells Ellyn. Today’s cannulas are now precisely customized, including a double-tipped version enabling the venovenous approach. The ECMO unit itself is smoother, handling blood cells more gently and oxygenating them more effectively. One thing that hasn’t changed is the vigilance. Wise calls the machine and the baby who needs it twins. One nurse stays with the baby and a nurse or respiratory therapist with his mechanical twin. “With ECMO, if something happens – a clot in the circuit, components breaking or rupturing, the cannula coming out of the neck – the baby is going to die if you don’t act immediately,” Wise says. Even with so many years of experience under its belt, the neonatal ECMO team regularly conducts “water labs” with the ECMO pumps stored in Wise’s office. They’re always primed and ready. Interestingly, babies on ECMO tend to revert to shunting their blood away from their lungs as they did in utero. When all goes well, the patient’s body will naturally shunt less each day, apparently as blood oxygen levels improve. In fact, the shunt closing is a cue that the baby likely is ready to come off ECMO. “It is weird, but it’s a fact,” Howell says. Newborn Ellyn’s chest X-ray slowly went from a wash of white to a more familiar-looking lung-shaped shadow. Darlene Williams, Ellyn’s neonatal nurse, told Carla and Brian during their morning phone call that while she didn’t want to get their hopes up, they “should probably bring the carseat that day,” says Brian, still unable to contain his tears. It was Nov. 16, 1995, his 34th birthday. “To this day, he says it’s the best birthday gift he has ever had,” says Ellyn. Ellyn rapidly grew into a precocious, active child and a seriously type-A young adult who remembers her first B, excels at softball, loves to share her opinion, is best friends with sister Ashley and is a nurturer by nature. Their pride is as palpable as their joy as they recall Ellyn’s early decision to be a doctor. In fact, the sophomore biology major at the University of South Carolina already has her Medical College Admission Test book. An adviser told her she also needed some experience. She’d reunited with Hatley when a classmate of hers and former patient of his died in 2009. Characterstically, Hatley told her to contact him if she ever needed anything. Last winter, she reached out to ask if she could shadow him. He responded with his cell phone number.